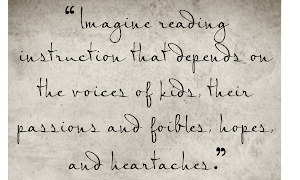 When you think about readers in your classroom, what do you see? What are successful readers doing? How do they demonstrate they are reading? 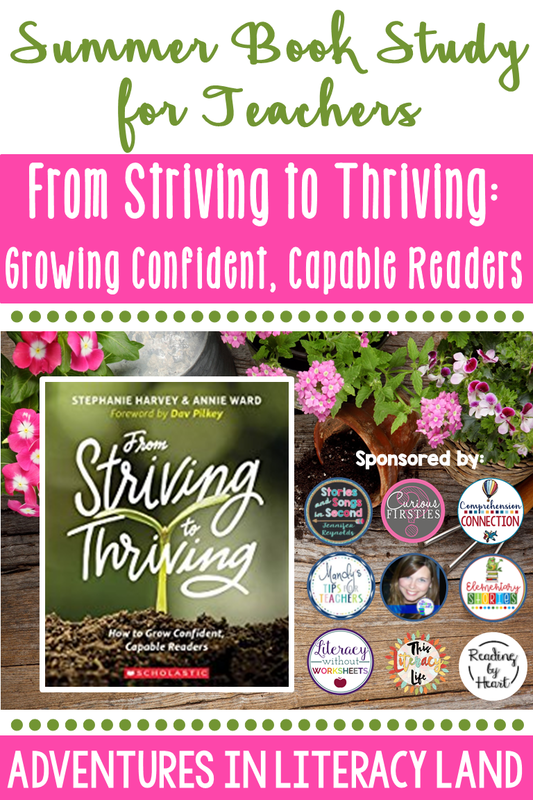 In the coming weeks, eight of our bloggers will help readers delve into these topics and the teaching tips offered through the book, From Striving to Thriving: Growing Confident, Capable Readers. In this post, we'll be taking a look at the introduction (a chapter all by itself) . 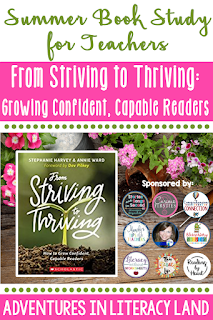 The authors of From Striving to Thriving, Stephanie Harvey and Annie Ward, have coined the terms striving readers and thriving readers to describe our students, and in the introduction, they explain why they have chosen to abandon the term strugging reader for the preferred term, striving reader. So let's begin by looking at the difference. Take a look at the quote to the right. Have you ever thought about the fact that the word "struggling" gives the connotation that the child can't do it or that he/she is less than. 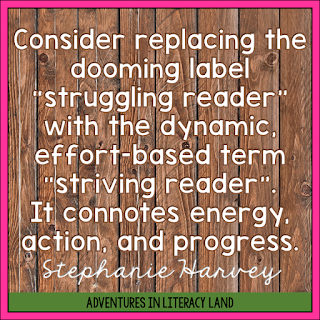 I think we've all used this label, but as we learn in the introduction, striving readers haven't achieved ____ yet. (Hint-"yet" is going to be an important vocabulary word in the coming chapters.) Striving implies that with effort, instruction, and time, the student will conquer the challenges he/she faces to become a thriving reader. and an understanding that readers have reading preferences. Putting sounds together to make words and words together to make sentences. Saying each word as it is on the page. Reading words with expression like we talk. Connecting personal experiences to the text. Thinking about the meaning of words as you say them. Connection written language to oral language. Well, according to our authors, reading includes six key skills. It is a personal process in that no two people will view a book in the same way. We bring our personal experiences to our reading and apply what we read to our lives. It is also a social process because we learn to talk, read, and write with our interactons with others, and we can't make meaning without deep thinking. 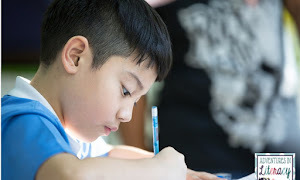 It is through thinking about what's read that readers turn information into knowledge, and this amazing realization helps all readers, but especially striving readers gain confidence. Reading is language. Students pull in all elements of language; graphophonics, syntactics, and semantics, to monitor their reading. Reading is also the connection between oral language and print (Concept of Word) , and finally, reading is of course the connection of sounds, letters, words, and paragraphs. Now that we have reading defined, we can move forward to talk about teaching and assessing it. Keep reading instruction embedded in real texts that really draw the kids in. 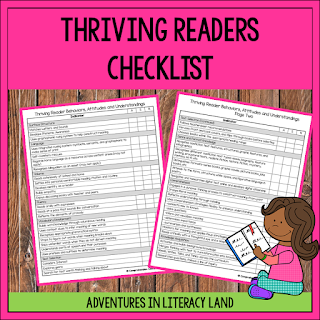 Use a variety of genres, topics, and formats. Have a classroom library bursting with choices and surround your kids with books. Immerse your students in the richest curriculum possible. Allow multiple ways to read. Take advantage of their questions and curiosities. When assessing, take in information that gives you student strengths. Keep in mind that the most effective assessment is inquiry driven. Consider what you want to learn about your student from the assessment. Think about the assessments that show you what your students know about reading. Encourage your kids to reflect on their progress. What are they doing well? What goals could be set? Teaches them to use strategies other than "sounding it out". Balance summative assessments with more child-centered formative assessments. Multiple indicators are always needed. A single test fails to deliver the sampling of data needed to truly problem solve. Remember this...Children are more than their level! Locking kids into a level is a real disservice to them since many factors impact a child's success with a text. The introduction ends with one page showing the Spectrum of Reading Behaviors. I think this was my favorite part, and one thing I thought would be quite helpful is a checklist teachers could use in working with their students. This checklist may or may not meet your needs. If not, I highly recommend that you make a list of behaviors you'd like to see at the beginning of the year, middle of the year, and by the end of the year that you can share with parents at conference time and have available when you are conferring with your students. You can also check out THIS ONE in my store. I've used it for a long time. 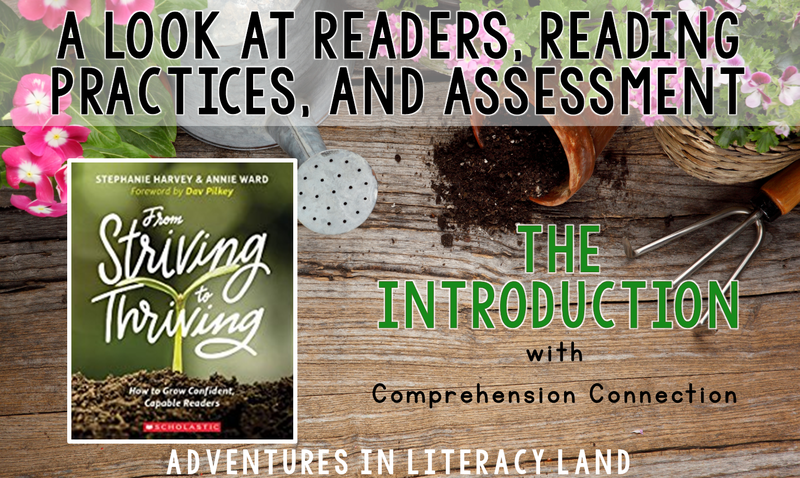 For me, the most surprising part in the introduction came when Harvey and Ward shared that they really didn't support differentiating and leveled instruction. At first I thought they meant leveled instruction at all, but I don't think they mean for teachers to give kids texts that are way beyond their reading level, but rather, not locking them in either. I think loosely leveled is preferred. Were you surprised by this too? I also was surprised that they were not fans of RTI either, and when you think about our intervention programs, what are we doing? Schools primarily follow an RTI model. (at least in my area) Tomorrow, I'll talk about what they advise instead. This year, what were the pros and cons of the program you used for your striving readers? When you think about your students, how do you know them as readers? Can you rattle off their book preferences and interests? How might you work on that during the coming year? Did your assessments provide you with the reading behavior information you needed in order to move your strivers along the continuum? If not, which assessments could you forego next year? Now that you've read the introduction, what changes do you have in mind for next year? 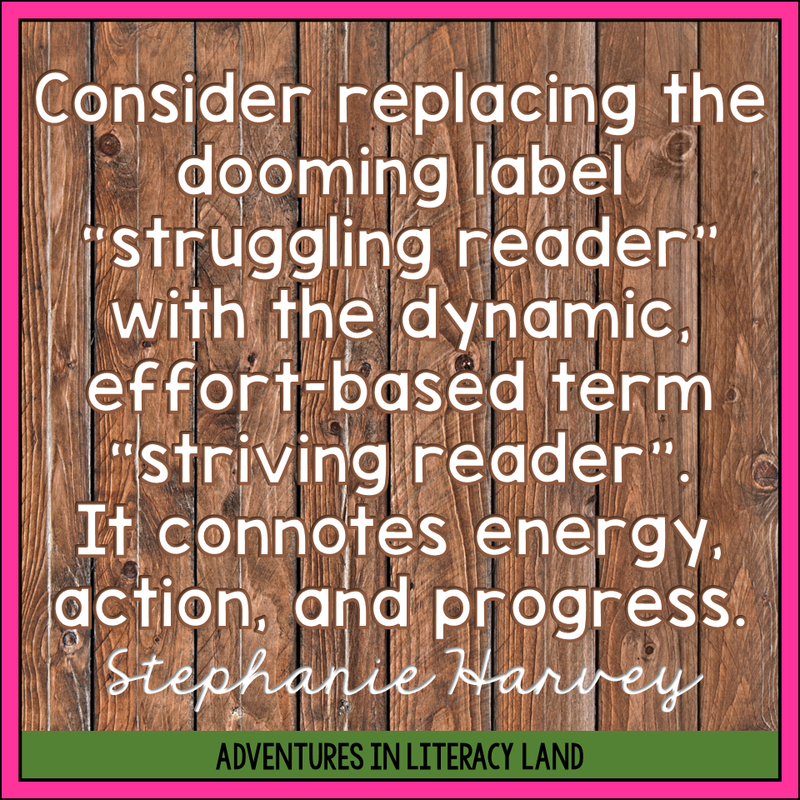 Remember our goal as teachers is to grow confident, capable readers, so come back tomorrow where we'll talk about tabling the labels. I just finished Chapter 1! I'm so excited for this book study this summer. So far, this book reaffirms everything I know about teaching reading!!! I love how it focuses on building a love for reading. For my intervention groups, I always try and offer lots of choices, so students are engaged in what they are reading. I'm anxious to get into the nitty gritty of the book to see what they advise in regards to intervention programs and classroom instruction, but yes...affirms! This book reminds me of what I really need to be doing and not locking into a program. Though I see growth in many of my students, I don't always see enough. I know the RTI model does not work for many of the students, especially with lack of parental support. 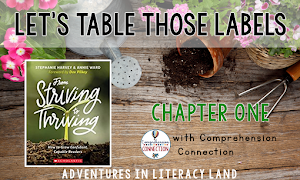 Changing how we look at intervention will help these striving readers become thriving readers. We have to find what interests them to move them forward, and canned programs DON'T do that, no matter how research-based they may be. To get our students reading, we have to find what they love! I'm loving this book! Chapter 1 was so good. So many "yes" moments as I was reading. Just finished part 2 of my post for chapter 1 Hope you like it. I am loving this book! It reconfirms my beliefs about reading instruction and has given me so much to think about as far as my own next steps to putting these ideas into practice. I especially think using the term "striving readers" is a crucial mindset shift for teachers. Too often the education system focuses on what students can't do yet, rather than their strengths and individual progress. When teachers change their mindset of how they view their students, it is especially empowering for students. Looking forward to the rest of the book study! I feel the same way. It's an easy read and filled with so many thought provoking points and ideas.